Quarterback Jordan McAfee threw for two touchdowns and set up a third touchdown. 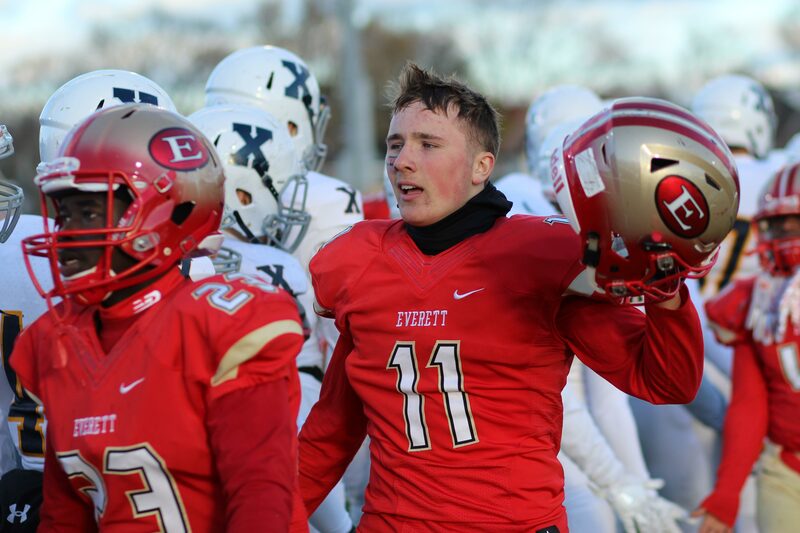 (Lynn MA) Everett won the 2016 Division 1 Super Bowl title, 21-7, over two-time defending champion Xaverian on Saturday afternoon at Manning Field in Lynn. A packed house saw Everett QB Jordan McAfee throw two touchdown passes and set up the other Crimson Tide score with another pass. 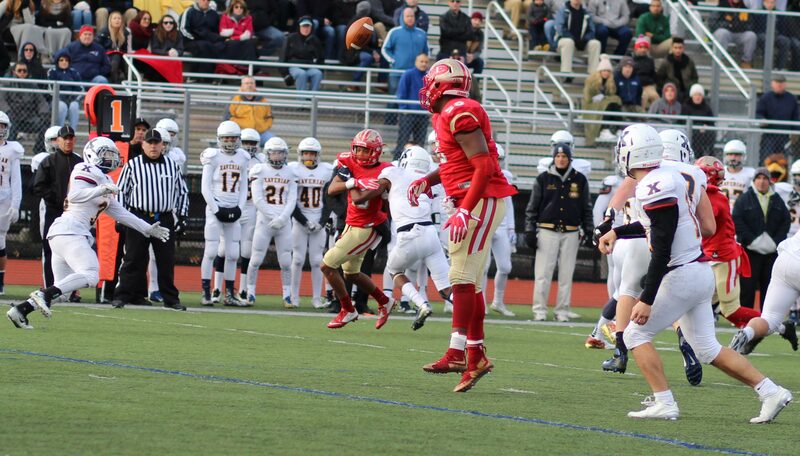 The UConn commit collected 211 yards in the air. Stung by a 14-0 deficit at halftime, Xaverian had to get away from its running game and play catchup through the air. 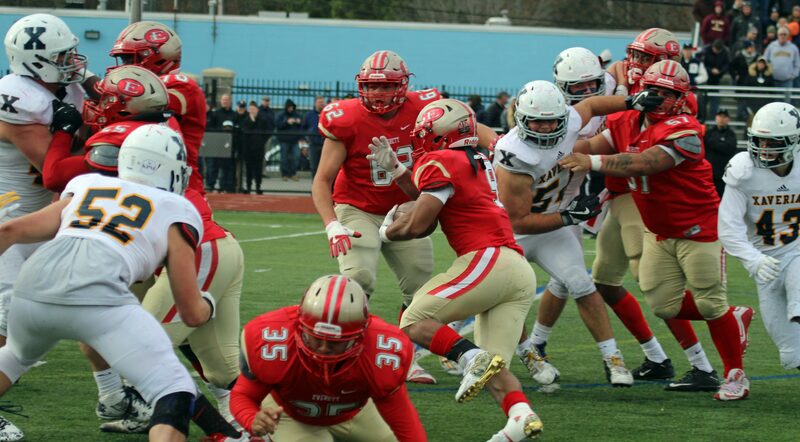 A pressuring Everett defense forced Xaverian quarterback Mattison Cronin to scramble numerous times in the second half. Everett added a third score in the final quarter (3:58) to take a three-touchdown advantage. The Hawks (10-2) scored late (2:55) on a 43-yard connection from QB Mattison Cronin to Mekhi Henderson. 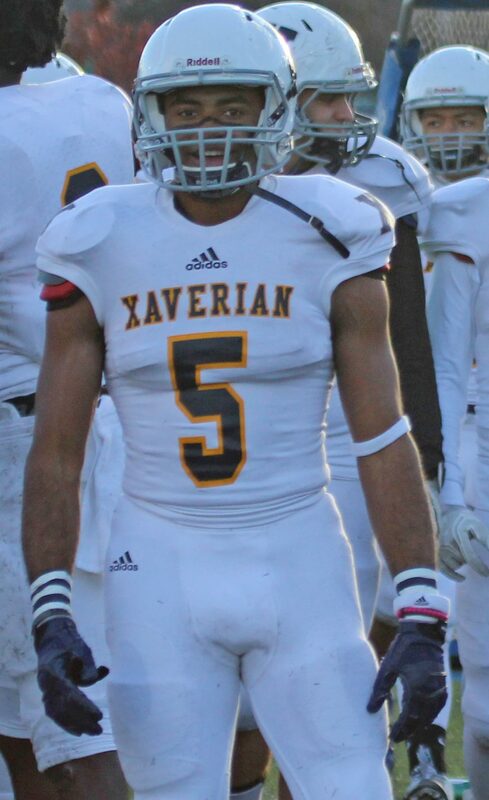 Xaverian would get the ball back for one last drive but defender Jason Maitre picked off a pass into traffic to seal the deal for the Tide. Everett grabbed the lead on their first possession. After Marvens Fedna ran for a first down on fourth down, QB McAfee rolled right and tossed a short pass to Mike Sainristil who did the rest covering 38 yards. The 8:54 score was followed by a Gabriel DeSouza extra point. 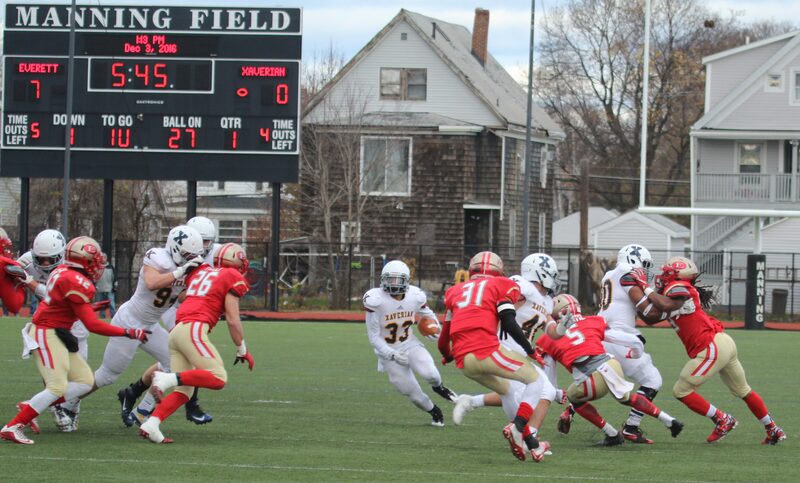 Xaverian then started on their 30, and with runs and scrambles by QB Mattison Cronin reached the Everett 14. There the drive died as Duane Binns sacked Mattison on 4th down. Early in the second quarter Everett set themselves up nicely with a 56-yard pass play from Jordan McAfee to David Zorrilla. To say that David was open is an understatement! Only the speed of two Hawks defenders prevented a touchdown. 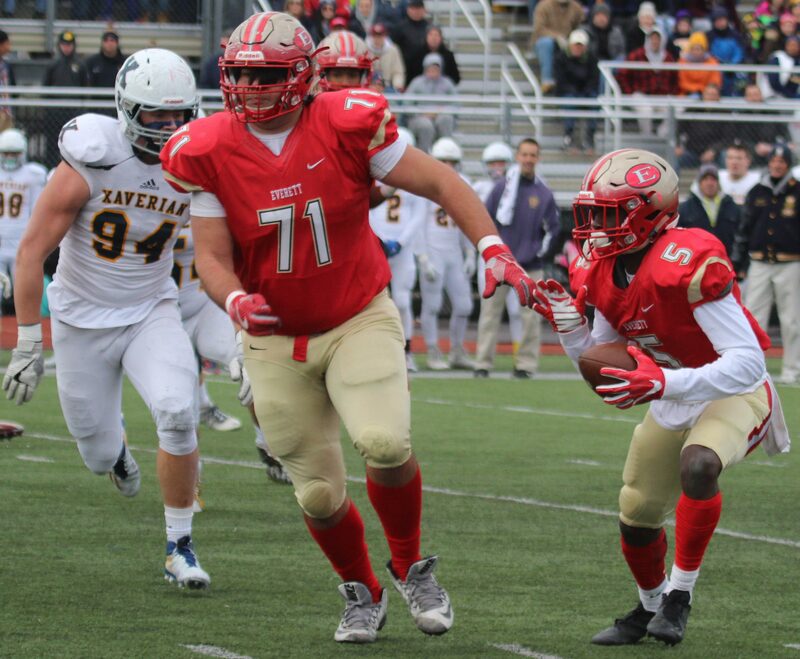 The touchdown prevention didn’t last as running back Marvens Fedna went through a hole up the middle for nine untouched yards to the end zone. Another kick by DeSouza had Everett ahead, 14-0, with 8:43 left in the second quarter. Marvens Fedna (9) goes through a huge hole to score untouched. 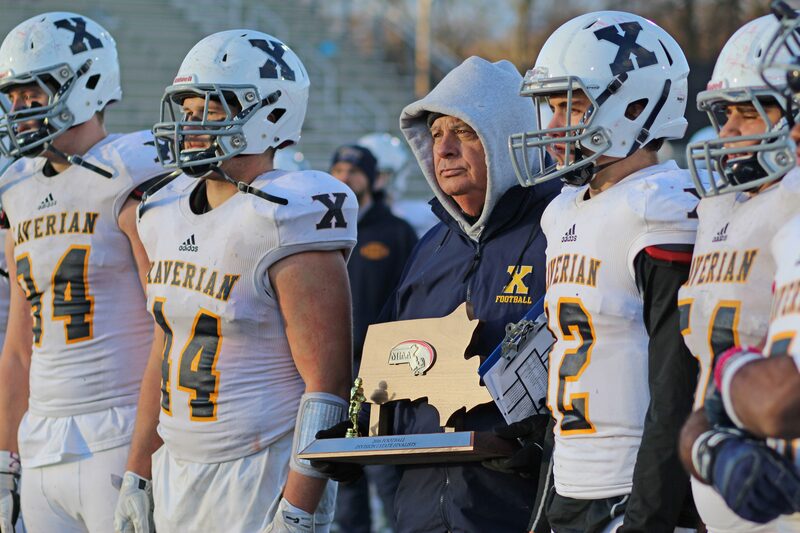 Xaverian had been deep in Everett territory in the first quarter with no points to show for it. Late in the second quarter they suffered the same fate. A nice catch by senior Call Flanders had the Hawks at the Everett 13 with over two minutes left. However, the Tide defense tightened and on a crucial 4th down, defender Carlins Platel prevented Sam Laurent from catching a first-down pass. So, what might have been a 14-14 tie ended up being a two-touchdown Everett lead at halftime. The Hawks did very little running in the second half except for Mattison Cronin scrambles. The Tide used yet another big play to get a third score. After Jordan McAfee converted a 4th down play with a QB sneak, the Tide went into a very tight formation. With four minutes left in the game you would assume that clock-eating runs were going to happen. Not so! Jordan faked a handoff inside and then floated a pass to the right to a wide-open Theo Zidor. Theo ran thirty-eight yards to the end zone with 3:58 left in the game. Another extra point was added. 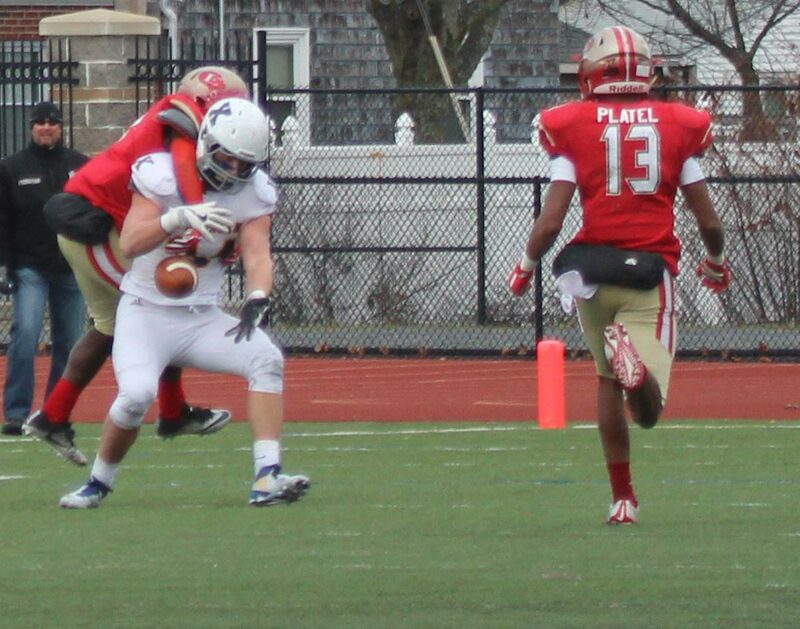 Would have been a good place for Xaverian to mail in the rest of the game but they didn’t. A little over a minute after the Everett TD the Hawks got six as Mekhi Henderson beat defender Clarens Pierre for a 43-yard strike. 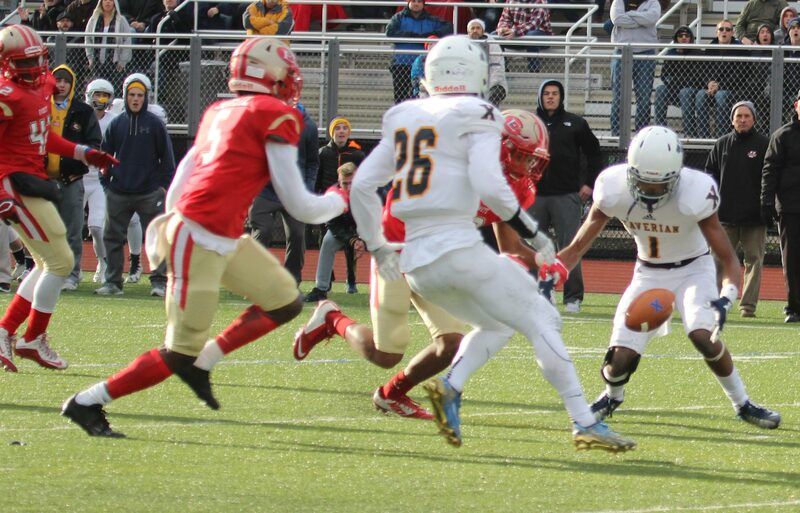 Xaverian had one more chance but a desperation pass into the middle of numerous Tide defenders turned into an interception (Jason Maitre) and this game was decided. Gerell Boyce recovered a fumble caused by a bad handoff between Mattison Cronin and AJ Ryan in the second quarter. 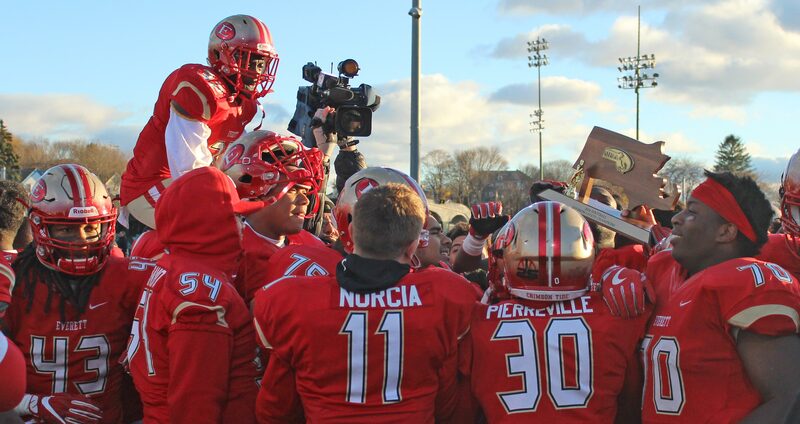 This was the 11th Super Bowl title for Coach John DiBiaso at Everett. He won another one at Weston. 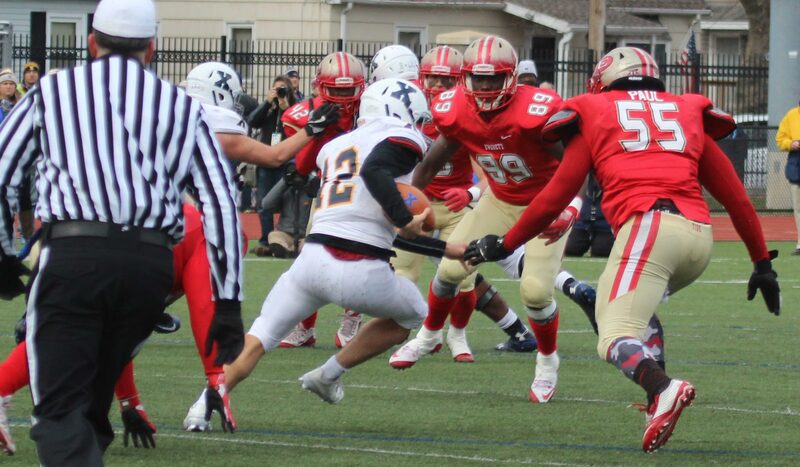 The Tide was 5-5 last year and had two early losses this season including a 17-14 one versus Xaverian. 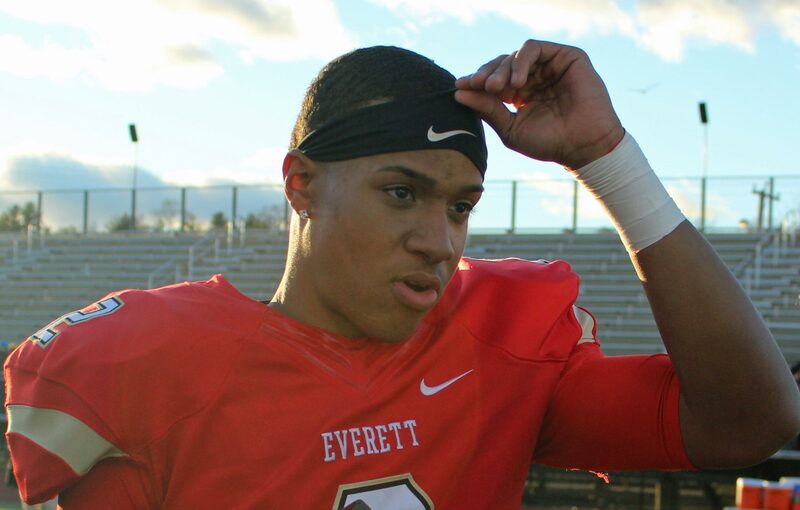 Jordan McAfee finishes his four years at Everett with over 4,000 passing yards. 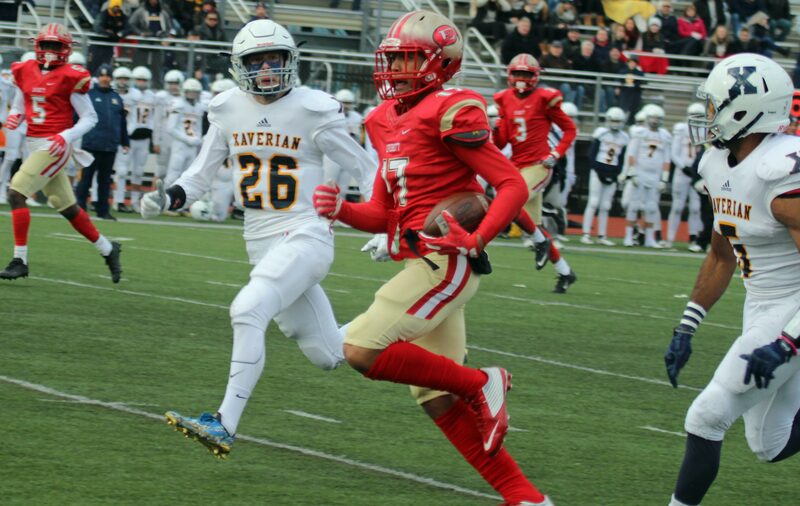 Jason Maitre had a 99-yard kickoff return for Everett in their first meeting with Xaverian. Devon Piccinin had five touchdowns and rushed for over 200 yards in the Hawks, 34-29 win over Catholic Memorial in the D1 state semifinals. David Zorrilla (17) off on a huge gain (56 yards) after catching a Jordan McAfee pass in the second quarter.